In part one of Rethinking the Future of Business, we examined the state of social media in business. Once again, we take a look at a recent report published by Altimeter Group’s Jeremiah Owyang, “Career Path of the Corporate Social Media Strategist.” As part of a study on social media strategists and the divergent career paths that lie ahead, Owyang reviewed the social framework for socially renowned enterprise businesses as well as corresponding strategies and resources for 2011. The results says more than we may realize at first blush. Most importantly, we’re given a looking glass into the genesis of a next generation business that’s more sociably aware and responsible. How a business embraces social media and ultimately how it organizes resources around engagement is directly tied to the internal influence of champions and the culture of the business. This discussion accounts for almost the entire second half of Engage. This is a critical discussion that will help businesses excel today and over time. That’s the impact of new media, it’s always new. Social media is simply the latest chapter in its evolution and its effect on business and society. In his report, Owyang shares five ways companies currently organize for social media. Of the 150 businesses Altimeter examined, 41% employed a Hub and Spoke model to support social media. This framework represents a centralized resource for guidelines, governance, best practices, and policies that supports cross-functional teams and business units. In my experience, I’ve also observed the hub and spoke model across most of the businesses I’ve helped. Many times, the hub is represented by a special unit, usually a social media task force or board of advisers made up of stakeholders. This team usually reports directly to the CMO or CEO or in some cases an executive vice president and its members consist of HR, Legal, Marketing, Sales, Customer Service, etc. However, these organizations are rather far along in the new media adoption cycle. And, it should be said, that this is only one stage in the maturation of a social business. For the more evolved and experienced organizations, the Hub and Spoke model scales to what Altimeter refers to as the “Dandelion” or the multiple Hub and Spoke model. 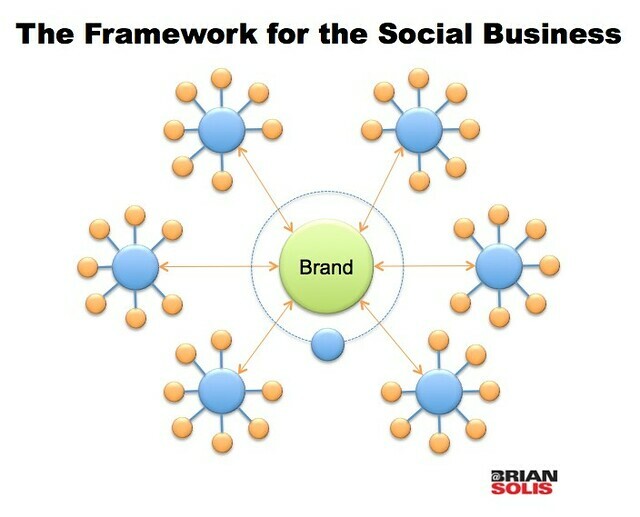 While only 18% businesses are currently structured to support social, we start to see the fluidity of such a schematic. A centralized system allows for effective top-down leadership as well as amplifies the need for harmony and direction. When we combine the two Hub and Spoke models, 60% of participating organizations represent the foundation for a majority of social businesses. Centralization is a key theme in the lion share of participating businesses. 28.8% of companies manage social media in one department, similar to that of corporate communications. In my work, you’ll see a fusion of the multiple Hub and Spoke archetype combined with this centralized approach. Altimeter found that almost 11% of organizations are not yet structured around social media. Instead, social is decentralized and this sets the stage for chaos and brand dilution. Of all of the companies interviewed by Altimeter, only 1.4% claim to run social media from a Holistic methodology. The executive management team responsible for the direction of the brand is of course at the center. But now we’re adding a centralized hub for social excellence between executive layers and business units. This model empowers the existing management and execution roles within each division to introduce social elements as they apply to each unique circumstance while still centralizing the resources and intelligence necessary to guide stakeholders. This hub protects the company’s mission and purpose to ensure brand integrity in new media. And, this new resource center maintains best practices, sets policy and governance, introduces new methodologies and guidance, and also provides the training and technology necessary to achieve desirable outcomes. Businesses are approaching new media differently and no one formula prevails. But it’s less about what is and more about what needs to be. Social media introduces new or long forgotten elements that serve as the foundation for relationships and affinity. Over the years it seems that the world of business and media placed process roadblocks, technology and automated intermediaries between the brand and the people who define success. While social media is not the only banner for change, we are given a new opportunity to renew the mission, purpose and commitment to the communities of people that represent our markets. Culture and leadership are at the root of adoption and ultimately how the organization embraces change. It’s not easy. The truth is that the bigger an organization is, the greater the challenges, and politics, to introduce change. But that doesn’t mean that we should cower in complacency. Our opportunity is to introduce collaboration internally before we can do so externally. It’s the difference between remodeling and rebuilding. Businesses must look within in order to clearly see what’s required. What we’ll learn, is that the business of tomorrow takes a human touch and social media are stepping stones to a new era of collaboration both internally and externally. Businesses will have no choice but to lead and respond as the rise of the social consumer upsets the balance of power between brand and customer. It’s up to you to ensure that the organization adapts accordingly. Your experience and vision are instrumental in designing an org chart and workflow that integrate the roles of listening and engagement departmentally and across the company. Whether you know it or not, the path that social media follows within the organization is in your hands. But as we’re learning, mastery of the latest social tools does not guarantee a place in the ranks of upper management let alone a place on the team period. The role of the social media champion is not timeless; in fact, the days of its designation are numbered. However, your role and the role of new media in your organization is developing as we go. Organizations need leaders right now. If you’re a leader, your tenure is defined by the decisions and actions you make now. Said simply, the role of a leader is earned today and over time. If you’re a strategist or champion, the question is, what will your position look like tomorrow and what can you do to shape its direction? This is a time for change…and change needs change agents and decision makers. But, dabbling in social media through the siloes of marketing, service, or communications is important, but it isn’t nearly enough to introduce the roadmap to produce internal and external transformation. The reality is that social media engagement opens the doors to new touchpoints that usually extend beyond the campaign or program operator. For example, if marketing runs a contest, customers may also use the platform to voice concerns requiring a response from customer service…but campaigns are rarely integrated and thus risk failure. As part of his report,”Career Path of the Corporate Social Media Strategist,” Altimeter Group’s Jeremiah Owyang surveyed 140 Corporate Social Strategists to surface details on existing social media programs. Reviewing the existing infrastructure and programs currently in play at some of the biggest and most often cited companies helps us understand where we are and also where we need to go. In part one of this discussion, we’ll look at the state of social media within business. It might surprise you that the official lifespan of social media at many organizations is only between 1-2 years (<40%) and under 1 year (~30%). Roughly 20% appear to run social programs for the last 2-3 years. Historically, most businesses are slow to embrace innovation and change. Owyang’s report found that ~10% of the companies he interviewed claim to have led social programs for the past 3-4 years with an additional ~5% claiming social existed between 4-5 years and more than 5 years respectively. In 2010, 40% of budget allocation toward social media ranged between $100,000 — 500,000. Less than 10% invested between $500k to $1 million, $1mm to $5mm, and greater than $5mm respectively. The lion’s share of budget seemed to dwell in the $10,000 to 100,000 range which is borderline peripheral. To say that I was amazed would be an understatement. 50% of businesses declare their organization to possess a “formalized” level of social media maturity. Another 20% claim a mature infrastructure. At least 20-30% of respondents admitted to a stage of experimentation. Obviously the sample that Altimeter Group polled for this report does not reflect the average organization. And I’d argue that the following findings do not align with social media’s true path toward the complete socialization of business — the integration of collaborative extensions to existing business units and processes. When businesses assert a formalized or mature social media foundation, what I believe they’re saying is that we’re convinced that social is critical and that we have integrated siloed programs within the organization. Within those silos, social experimentation has most likely matured. But to claim goals, outcomes, desired performance levels or collaboration is mature is a great fallacy. These “mature” programs are usually bolt-on and exist within service, marketing, or communications, but rarely are they communicating across the organization. And herein lies one of the greatest challenges facing businesses in 2011 and 2012. It’s time for a bit of culture shock. Case in point. Almost 50% of participating companies in this study house social media in marketing. Another 30-40% place social in corporate communications. These two groups represent both the majority and potential confinement. In most cases the above list in addition to those not accounted for, do not truly work together in most businesses. Yet, each one of these divisions in addition to sales, HR, finance, et al, will at some point require a social approach. In my experience, as these divisions have added interactive processes to the mix, they have either done so without the knowledge of other more experienced divisions or they have demanded the centralization of a new media organization to help lead the way. Without a centralized hub helping the business to become more social, we risk brand integrity, dilution, and also market confusion. This is why Engage is so thick…social media’s impact on business is enterprise or company wide. The time for greater understanding and leadership is upon us. We must think holistically and how officially introducing the 5th P (people) in to the mix calls for new processes, systems as well as perspective and direction. This isn’t supposed to be easy…one Fortune 500 company that I’m working with turned into a 3+ year adventure in which we redesigned (ing) the management and execution infrastructure. It’s been both tremendous and arduous. But I realized that in order to inspire “open leaders,” they need a little help…and it doesn’t necessarily unfold because executives suddenly realize the potential of social media. It happens because they can see the benefits of how collaboration and listening along with other variables starts to impact the bigger picture and the bottom line. My focus over the last several years and also in the time to come, is aimed squarely at the C-suite and middle management. I spend most of my time now with executives (not the c-level at first, but those who report to them), who realize the opportunities, risks, and understand how to work the political machine to get things in motion. It’s a combination of change management and organizational transformation, but it’s also propelled by playing the game internally…all rooted in experimentation and the presentation of progress. It’s not enough to get social presences online, recruit mommy bloggers, launch new badge programs or specials on Foursquare or to activate influencer programs. We need structure, organization, guidelines, direction, and meaningful collaboration across the enterprise. As a result, new media change agents and those who work with them start to bump up against the roles that management consultancies such as McKinsey address. But even the most progressive management consultancies are struggling with drafting the blueprint for the future of business. The democratization of media triggered the equalization of influence. Consumers are empowered and as a result, they demand a more engaging experience. Businesses must now add a human touch in order to not only earn relevance, but also build a vibrant and influential community. This will take time and will force us to rethink everything including behavior, structure, and vision as well as how we approach social today. The truth is that social media isn’t forcing this complete (r)evolution, it was simply the latest catalyst to prompt an overdue domino effect to create a true customer-centric organization. Brian Solis is the author of Engage and is one of most provocative thought leaders and published authors in new media. A digital analyst, sociologist, and futurist, Solis’s research and ideas have influenced the effects of emerging media on the convergence of marketing, communications, and publishing. Follow him on Twitter @BrianSolis, YouTube, or at BrianSolis.com. Brian Solis is the author of The End of Business as Usual, a book that explores the changing consumer landscape, its impact on business, and what companies can do to adapt and lead. His previous book Engage is regarded as the industry reference guide for developing effective social business and social media strategies. Solis is also a principal analyst at Altimeter Group, a research-based advisory firm that studies customer behavior and disruptive technology to develop new business models and go-to-market strategies.